Ever wonder how to buy boots with a good fit? Whether you’re buying boots for hiking, on the job, or working around the home, it is important to know how to find the best fit. A proper fit is when the boot is snug enough to prevent your feet from moving inside (which is how blisters are born) but not so tight as to constrict circulation. It’s best to be wearing the socks that you would ordinary wear with these boots. If they’re hiking boots, wear your hiking socks while fitting them. Before lacing, push foot forward. One finger should fit behind heel. Lace boots and stand. Wiggle your toes. They must not be cramped. Kick a wall. Your toes should not touch the end of the boot. Rock up and down, squat and bounce. 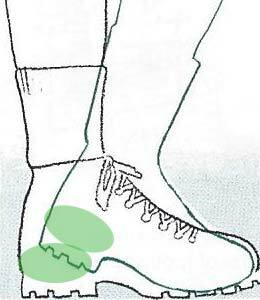 Heel should not move in boot. 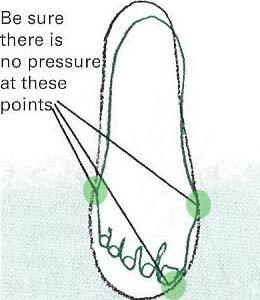 Stand on sides of feet to test for ankle support and painless flexibility. I have bunions, so I am hard to fit. When I was young, I wore 3A shoes with a 5A heel. Now I wear a D shoe with a 5A heel. Very hard to find shoes that fit, even harder to find boots, and they are so much more expensive. I am going to print this out and take it with me next time I go shoe or boot shopping. Thanks. Good ideas Ken. 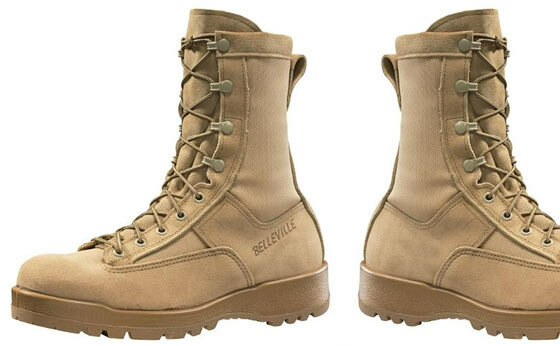 Sometimes, when boot shopping, the left boot may be perfect but the right one isn’t. (or vice versa). Get several boxes of the exact same boot and try all the right ones. Sometime you have to break up a pair from the same box. Just my 2 cents. Also when boot shopping be sure to wear the socks that you would normally wear when you wear boots. Such as heavy wool socks if you do lots of outdoor work in the cold weather. I made the mistake of trying on boots without taking the socks into consideration. When I finally did wear them with the heavy socks I found they were too tight and cut of the circulation. Having hiked many thousands of miles in a variety of boots I feel qualified to express an opinion here. Cheap boots “will” let you down. Skimp on lots of things, but never your boots or socks. I would rather be naked if I had to choose between clothes and good boots. Funny, I recall a friend who hiked naked in Washington State once for two weeks, except for his boots. You do get a little crazy when you don’t see anyone in the mountains for a while. My first choice- Danner Ft Lewis boots with SmartWool sox. Had to laugh at the last one. My ankles are so flexible I haven’t gotten a sprain in years. They just bend and snap back. Even at the worst I’m walking normally within a few minutes. You should also buy your boots after you have been on your feet for several hours. Your feet will swell slightly as the day goes on. This will insure a more comfortable fit. Also, make sure to pick up an extra pair or two of laces for the bug out bag. Trade out the stock laces for paracord. I have flat feet but that never prevented me from fighting wild land fire and hiking over hill and dale. The heavier the load means the better support I need from my boots. When fighting fire, I wore Irish Setters (red wing) – an all leather boot with vibram soles. We spent a lot of time walking around ashes and coals(hazard pay). Nylon boots would melt. They can be resoled and I still have my last pair that saw Yellowstone burn in 1988. Clean and treat the leather with mink oil 2x per year. I stand and walk on concrete these days so I still wear lightweight hikers at work for good arch support and all day comfort. Doc Jackson and Peanut Gallery both made great points: #1 My left foot is 1/2 size larger than my right foot and #2. I wore wool socks over liner socks when living in my boots for days on end. Although my feet stopped growing long ago, my feet will swell at the end of a long day walking the floor or the fire-line. Modesty goes out the window and I buy my boots 1/2 to 1 size larger or buy my boots at the end of the day when feet are swollen. There is nothing more miserable than boots that are too small. I count myself as lucky being able to make a living by walking either the floor or the wilderness for most of my working life. I do not skimp on boots. Comfort is key. Thanks, I should have read this 50 years ago. So many times……. I have worn Merrill’s for several years as one of my preferred shoes for the easy type hiking that I do. Last spring i had the sole start coming apart and they gave me a new pair for free. Now that pair is having problems. The sole has tread and around the tread they put donut shaped lugs. It seems that they are glued on. Well, they’re coming off. Don’t think that it really hurts anything, maybe affect stability??? Anyway, not happy and don’t plan on buying anymore and can’t recommend them either. I love the comfort of Merrills but I balk at the price. In our local area, I have been buying Columbia brand light hikers in nylon/goretex or waterproof membrane. They are local and relatively inexpensive. If you’ve got a nicer brand coat, like North Face, contact the manufacturer. Told my friend to do this with his raincoat that had delaminated…they sent him a nice new one to replace it! Have seen that happen twice now. Free’s much better than buying a new one! Check out Timberland Pro Series. 2nd pair now. Pretty expensive, paid $165 I believe. 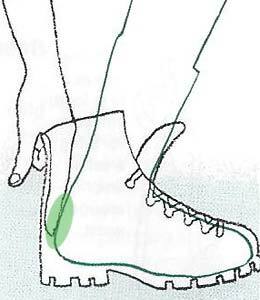 But what makes them unique – have a metal plate in the sole to prevent nail punctures. And no, even after first pair wore out, I never felt it, and they aren’t noticeably heavier than any other boot I’ve rolled. Thank you Ken for this explanation. I have been getting the wrong size shoes for years. I have problems with my feet getting very, very cold in the winter so I would buy shoes that were a full size larger to accommodate this wool socks and polypropylene sock liners.I recently ordered two pairs of two pairs of Wolverine DuraShocks Waterproof Insulated Steel-Toe EH 6″ Work Boot in size 7 and 7½. I learned from another post that for a winter boot, wear thinner socks. Combining what I learned from this post and the information about socks I chose the size 7. It was so nice to work outside in the cold and have warm feet. The thing that made me choose size 7 was the information about heel bounce. I also learned from another post that your toes should have about an inch of room in front of them at all times. This is not obvious if you purchased steel toe shoes or boots. Here is some advice for others to test this. 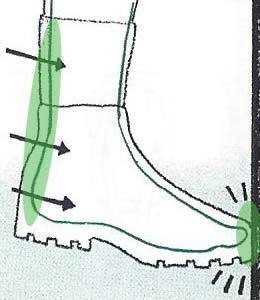 Find a 1″ piece of foam and push it to the front of you boot. Then put on your boots. If you toes are just touching the foam you are in good shape. Thanks to your advice and Wolverine having EE wide boots I am one happy camper with boots that fit correctly. Glad that the boot info helped you out! I just got a pair of Clarks Women’s Kearns Flash boot – they fit fine with socks but my heel comes up as I walk. Any suggestions? 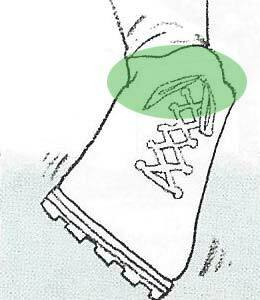 You might be able to get a cobbler to sew in a patch at the heel of the boot to tighten up that spot, stop your foot slipping up. I have flat feet, bunions and hammertoes, so I went to a shoe store that specialized in orthotics. My foot length is a size 11 medium, but my arch length is a size 12 1/2 medium. The shoe specialist fitted me with a arch support and told me I needed a size 12 medium boot to correct my bunions and hammertoes. I did that and after 3 months my toes are straightening out and my bunions are receding and big toes are straightening. Amazing what being fitted with the correct size boot will do to correct foot problems.